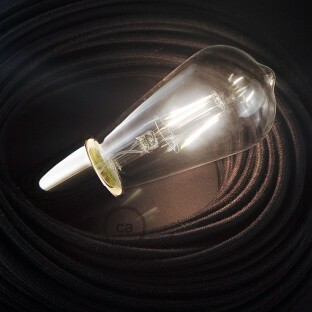 The fibre cable matched with ceiling roses, lamp holders and bulbs to create lamps, single or multiple pendants, table or bedside lamps and wiring, and floor lamps. Choose between 10,000 products. Lamp wiring, TM05 Gold Rayon 1,80 m.
Wiring Pedestal, TM05 Gold Rayon 3 m.
Create your RC01 White Cotton Snake and bring the light wherever you want. Create your RC01 White Cotton Snake for lampshade and bring the light wherever you want. White ceramic spider, multiple suspension with 6-7 pendants, RM01 white cable. Made in Italy. Create your RC04 Black Cotton Snake and bring the light wherever you want. Create your RC04 Black Cotton Snake for lampshade and bring the light wherever you want. Cream ceramic spider, multiple suspension with 6-7 pendants, RS82 brown cable. Made in Italy. Lamp wiring, TM07 Lilac Rayon 1,80 m.